The image of Lady Liberty has graced United States coinage throughout the history of the U.S. mint. One of the most common and highly sought images of Lady Liberty on a coin is the Morgan silver dollar. The Morgan silver dollar features a profile image of Lady Liberty looking to the right on the obverse side. She has long hair and wears a cap. The reverse side shows the image of a small eagle. Morgan silver dollars were minted between 1878 and 1903. After 1903, the silver dollars were not minted and many existing dollars were melted down. 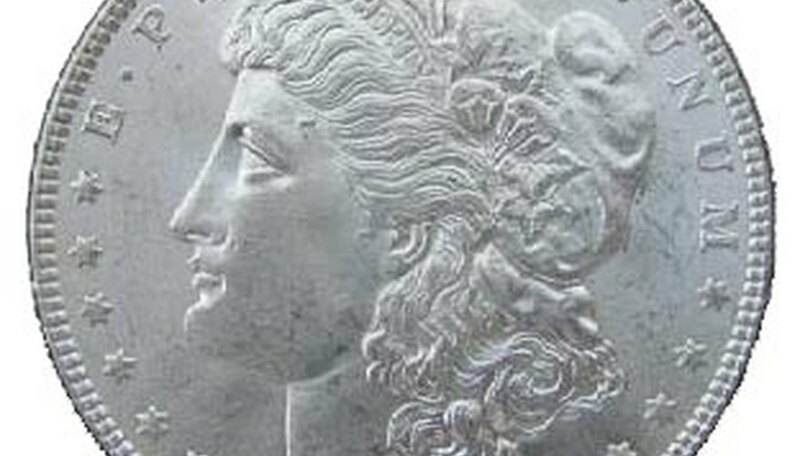 The Morgan silver dollar returned in 1921 for a short time before being replaced by the Peace dollar. The Liberty silver dollar was designed by George T. Morgan, a British engraver hired by the mint director Henry Linderman. He was chosen over chief engraver William Barber because of unsatisfactory designs Barber designed for other U.S. coins. Philadelphia schoolteacher Anna Willess Williams was the inspiration for the Lady Liberty design. Morgan had her pose to help design the features of Lady Liberty. The value of a Liberty silver dollar is based on condition, but all silver dollars have a minimum melt value. The melt value for a Morgan silver dollar is $9 to $11. Any coins with a Carson City mint mark are worth $60 to $2000 depending on the condition. The most valuable coin of this series is the 1893-S, worth more than $3,000 in mint condition. How Much Is an 1896 Silver Dollar Worth?